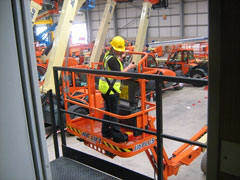 Do you know who is using access platforms at your workplace? Have the platform operators been trained and familiarised on the equipment that they are using? Falls from height remain the biggest killer at the workplace. Most falls occur when people use inappropriate equipment or methods to work at height. In the European Union, the Temporary Work at Height Directive 2001/45/EC has focused attention on safe work at height. In the UK, for example, the Work at Height Regulations (2005) state that employers are required to first analyse if any temporary work at height is necessary, and if so, to devise a safe way of doing it. It is important to select the right piece of equipment for the job, ranging from ladders and scaffolds to mobile elevating work platforms, or MEWPs. Ladders have the advantage of low cost and easy portability. They should only be used for low risk, short duration work, however. When used, ladders should be in good condition, prevented from slipping and used by competent people. There should always be a handhold available. There are different categories of MEWPs to meet various needs. The two most typical are scissor lifts (mobile verticals 3a) and self-propelled booms (mobile booms 3b). They are most often used in construction, but also in manufacturing and cleaning and maintenance. For work requiring higher mobility, there are vehicle-mounted platforms, or VMPs, and trailers that can be hitched to most vehicles. VMPs can, for example, give 26 metres of reach on a 3.5 tonne truck used for street lighting, or 100 metres of reach on a specially designed vehicle for heritage restoration work or wind turbine maintenance. Push-arounds and vertical platforms provide an efficient form of access inside buildings - for stage work or storage - where mini-scissors are also very effective. MEWPs reduce the potential for damage to buildings as the structure is not used to support temporary access. These modern machines make it possible to work in restricted spaces and to reach narrow openings, with minimal noise and emissions. If used correctly, these machines are very safe and offer an efficient option for work at height. MEWPs are highly manoeuvrable and can reach restricted areas efficiently. Research commissioned by Crown House Technologies, part of the Laing O’Rourke Group in the UK, has found MEWPs to be safer and more effective compared with other methods for work at height, even for low level access. The findings were the result of a complete review of the work at height procedures - up to 4.5 metres - for mechanical and electrical installation carried out by Crown House Technologies in 2008. Falls from height are the primary cause of serious injury in the construction industry. The detailed review found that just under a fifth of all accidents on site are related to access equipment. A small proportion of these - 19% - are caused by MEWPs, compared with podiums, mobile towers, ladders and A-frames. A series of time and motion studies were also undertaken, using different types of access equipment on two different projects. The aim was to understand how long typical tasks took with the variety of equipment that had been used in the past. The results showed that the potential risk associated with working with small MEWPs was significantly lowered than when using either podiums or mobile aluminium scaffold towers. Furthermore, MEWPs were found to be three times more efficient to use than mobile towers and podiums during these tests. MEWPs are expensive to purchase, but can be easily hired from rental companies, who may be able to provide machine operators if requested. The UK and France are two of the more mature MEWP rental markets in Europe. Typical platform users are usually electricians, plumbers, painters, cleaners and maintenance workers - people who do not operate platforms as their main occupation and who might not have received structured training to use access equipment. The Work at Height Regulations require employers to provide their staff with adequate training in the use of whatever form of access equipment for work at height. Section 5 states that “every employer shall ensure that no person engages in any activity in relation to work at height or work equipment for use in such work unless he is competent to do so.” Employers should thus have in place a policy for access equipment use and training. Training ensures that platform operators are aware of the potential risks and that they use the equipment in a safe and correct way. There are different levels of training depending on the level of competence, whether it is to simply operate a MEWP (operator), to demonstrate how to operate a specific MEWP (demonstrator) or to train others on how to operate MEWPs (instructor). There are also different training courses depending on the category of MEWP. A Push Around Vertical (PAV) which has no mechanical drive and which can be physically pushed around requires a half day course. Scissor lifts (3a) and self-propelled booms (3b) usually take one day of training, while more complex machines such as a 100-metre truck-mount (1b) can require up to two or three days of training. MEWP training can be obtained at construction schools, from equipment manufacturers and rental companies, or at specialised training institutes. It is also available through the not-for-profit International Powered Access Federation (IPAF). Those who successfully complete training are awarded a safety guide, a log book, a certificate and a PAL Card (Powered Access Licence). The log book should be filled out and signed after each job to document operator experience. The PAL Card is valid for five years, after which it must be renewed. This ensures that operator knowledge and skills are kept up to date. The PAL Card features a photo of the holder and shows the categories of machines that he or she is trained in. The PAL Card provides proof of training in the use of platforms, while the log book documents operator experience. The training covers these broad areas: MEWP categories, structural parts and MEWP selection, regulations and standards, pre-use inspections, safe operating methods and hazards, do’s and don’ts, parking, accidents, near misses and dangerous occurrences. A training course usually lasts one to two days and covers both theory and practise, including a written test and a practical test. Training makes users think more consciously about machine use and safety. It highlights basic do’s and don’ts and safety procedures that should be followed when using various types of MEWPs. For instance, users are instructed not to tie up sliding mid-rails. On boom type platforms - self-propelled booms, trailer push-arounds and vehicle-mounted platforms - it is strongly recommended that operators wear a full body harness with an adjustable lanyard, used to provide work restraint and adjusted to be as short as possible. This prevents the operator from being catapulted out of the basket in the event of an incident. On vertical lifts - scissor lifts and vertical personnel platforms - it is not normally necessary to wear harnesses, other than in exceptional circumstances. The most important thing to remember is that the need for a fall protection system will be the outcome of a job-specific risk assessment undertaken prior to work commencing, and taking into consideration the manufacturer’s operators’ manual. Lanyard damage and abrasion can seriously compromise performance. Ideally, operators should have their own harnesses for which they take responsibility. Be very careful with the connectors used: karabiners must be oriented longitudinally, not laterally. Do not attach any harness or lanyard to something outside of the basket of the boom. One of the most common causes of accidents is the ground giving way beneath an outrigger. All MEWPs depend on the condition of the ground they stand on for their stability. Soft or hollow ground may give way when subjected to the loads of MEWP wheels or outriggers, resulting in the machine being out of level and unstable. It is therefore vital to assess the ground conditions before driving, setting up, using or parking a MEWP on any surface. Use spreader pads beneath all outriggers. IPAF’s ‘Spread the load’ campaign calls for the proper assessment of ground conditions and the correct use of stabilisers, outriggers and spreader plates. It is available to read in seven different European languages - including English - and leads to a multitude of technical guidance notes that are cross-referenced with various standards that apply. See more here: www.ipaf.org/spreaders. During use, it is important that operators refer to the level indicators on platforms and take notice of any warnings. If the level indicator suggests that the operating limits are exceeded, the operator should lower and then reset the machine in a level position. Regular checks should be made on outriggers and spreaders. Care should be taken in using MEWPs to lift and install materials. A MEWP should not be used as a crane by suspending a load beneath the platform using slings or any other type of lifting gear. The Safe Working Load (SWL) should always be clearly marked on machines and is the maximum load that the MEWP will safely carry, including the weight of all people, tools and equipment. Overloading by exceeding the SWL is extremely hazardous and should never take place. Not only may it cause the machine to overturn, but it may also damage the machine. Shock loading a machine by the sudden increase or decrease in weight, or uneven distribution of the load on the work platform, could destabilise the machine and cause it to collapse or overturn. Extra care should be taken when planning and using MEWPs in confined overhead areas. This type of work has increased in recent years and led to a number of accidents. In these incidents, it was reported that operators were pushed onto the platform controls, which led to their sustained involuntary operation and the operator becoming trapped, or worse, crushed. Operators are urged to be continually aware of the surroundings and to continually observe - before and during the raising or lowering of the platform - always checking for obstructions above and below, or people. Site managers also need to be aware of specific precautions and procedures when planning and supervising work in confined overhead areas. Emergency and rescue procedures should be included as part of the risk assessment for each job. Rescue plans should be compiled in order to comply with current legislation and they should be brought to the notice of those exposed to the risk of working at height, and those supervising and managing the same work at height. The emergency and rescue plan should identify trained, site-based personnel who would be available to lower the platform using the control panel or emergency descent system situated at ground level. The emergency descent system should be clearly signposted on the MEWP; for example, by use of a decal. Trained operators should carry out daily/pre-use inspections and function checks to ensure that a MEWP is safe, complete, clean and that it works properly. They should inspect the entire machine both before and after use, including the power source, all working parts, the structure and the vehicle mounting - where applicable - in conjunction with the manufacturer’s manual. Operators should keep a written record of inspections. They should not attempt repairs or adjustments which they are not authorised to carry out. If they discover any defects, they should isolate the machine, tag the machine ‘Do Not Use’ and report the machine as defective. When carrying out inspections, they should never work under a raised boom or platform unless movement has first been prevented by means of blocks or special locking devices fitted for the purpose. MEWPs must be thoroughly examined by a competent person every six months. Operators should check for a current certificate or report of thorough examination. Further advice on the safe use of MEWPs can be obtained from the IPAF, website www.ipaf.org, which has a wealth of resources on safe work at height. The publications and films section features technical guidance and videos covering various topics including use of harnesses, exhibiting powered access equipment, familiarisation, ground conditions, rescue plan, and inspections and thorough examinations.